You have come to the right place to quit smoking forever. Your smoking habit is run by your subconscious mind, the part of your mind that runs your life. Your subconscious mind is where your habits reside and where all learning, behaviour, and change takes place. Believe it or not, there was once a one-time “benefit” when you first smoked; such as, to fit in with your peers, to look cool, to be a rebel, or because you looked up to the people who smoked. Your subconscious mind acts in the now, so if you are not consciously in charge of your mind there is a conflict between this part of your mind and your conscious mind where you make your logical decisions. It is still running the old program for the one time ‘benefit.’ It hasn’t been programmed to believe otherwise, so you are out of “sync”. This is why so many people struggle and feel powerless to conquer their smoking habit. We focus on reprogramming your subconscious mind to understand the benefits of being a non-smoker. When both parts of your mind work together it is far easier to achieve your goal to quit smoking. We combine tools from within the Sciences of Success, including NLP (Neuro-Linguistic Programming), neurological repatterning and advanced hypnosis, which is the main part of your session. By disconnecting your habit of smoking, breaking your triggers and associations, you free yourself from the desire to smoke. Together, we reprogram your subconscious mind with suggestions that are in align with your goals and desires to quit smoking for life. We use your words, desires, and goals. This program is so successful because we work at the source of your smoking problem with hypnosis. Mandy Napier has been helping people quit smoking for ten years, so has years of experience and numerous testimonials. The price of your program is based on what the average smoker spends in 4 – 6 weeks – a small price for a lifetime of benefits and better health! Hypnosis works by communicating with your subconscious mind. We make decisions, think and act with our conscious mind. Our subconscious mind controls our habits. In the relaxed state of hypnosis, which is similar to being in a trance-like state – a state we frequently spend much time every day – we communicate directly with the subconscious to change habits. Hypnosis is proven by scientifically sound applications and is used in medicine, dentistry, sports, law enforcement, education and behavioural changes. Hypnosis and NLP are completely safe. You are aware and in control at every moment. 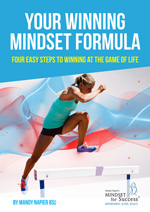 You cannot get stuck in hypnosis and you cannot be made to do something against your will. Hypnosis is a safe, relaxing and enjoyable experience. 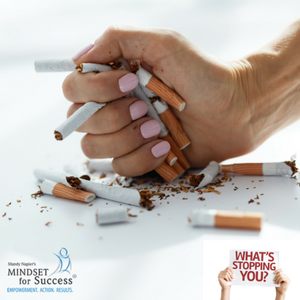 Check out other Success Stories from happy clients who are now living a smoke-free life because they quit smoking with Mandy Napier’s Mindset for Success. So, book your program and call Mandy on 0408 666 176 to book your appointment. Or, complete the inquiry form on the right-hand side of this page, if you have any questions.